The Presidium of the Vietnam Women's Union held a meeting with female deputies of the 14th National Assembly (NA) in Hanoi, on November 13. Vietnamese women have made considerable contributions to the national socio-economic, security and defence development. Female deputies of the 14th National Assembly account for nearly 27% of the total number of NA deputies - a fairly high rate compared to other countries in the region and the world. Vietnam also has three female Politburo members and first NA Chairwoman in this term of office. Speaking at the event, NA Vice Chairwoman Tong Thi Phong said that 2019 is the year to prepare for the Party congress at all levels towards the 13th National Party Congress and the election of deputies to the 14th NA and deputies to the People's Council at all levels for the 2021-2026 tenure. Therefore, the Vietnam Women's Union and female deputies of the NA should take the initiative in introducing qualified female officials to the Party, State and NA bodies. 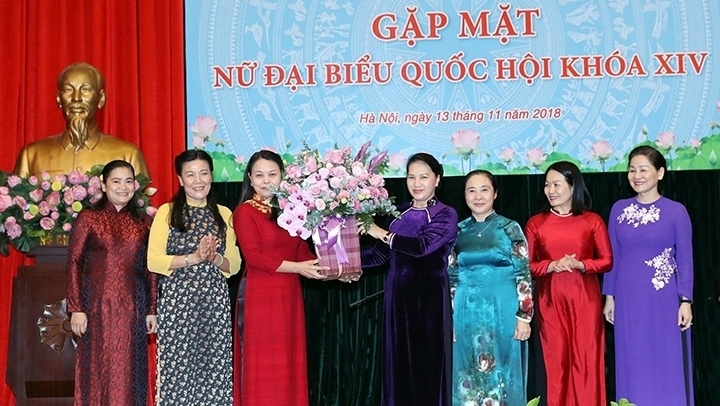 The NA Vice Chairwoman also asked the Vietnam Women's Union to coordinate with the group of female NA deputies and other relevant agencies to propose policies and solutions to enhance the capacity of female officials and promote education on gender equality in order to increase the participation of women in politics.